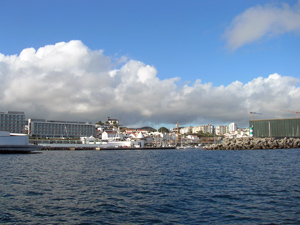 The capital of São Miguel and the Azores, with more than 63000 residents, is the largest city, busiest harbour and the commercial centre in the archipelago. Nearby is the airport with daily flights to Lisbon and the other islands - a convenient place for crew changes. In summer ferries runs between the islands. In Ponta Delgada there are consulates for the United States, Canada, England, France, Germany, Spain, Italy, Finland, Norway, Sweden, Denmark, Austria, Belgium, Netherland and Brasil. In 2000 a newly built hospital was inaugurated. Many other doctors are located in the town, some of whom speak English and French. Ponta Delgada has the best facilities for stocking up. Many spare parts can be found that are not available on the other islands. For provisions there exists several supermarkets, two hypermarkets and restaurants. 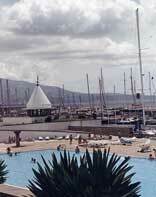 For pleasure there are bars, cinemas and discotheques. Ponta Delgada is an excellent base from which to explore the interior of São Miguel. The Marina Pero de Teive (37°44,3´ N / 25°39,5´ W) reserves 50 berths for visiting yachts and is equiped with water and electricity (220 V) on all pontoons, a laundry, a filling station for petrol and diesel, a 25 tons travelift, swimmingpool and skippersbar. Close to the marina are located banks, postoffices, internetcafes, a bakery, supermarkets as well as a municipal market, open daily, with fresh fruits, vegetables, meat and fish. 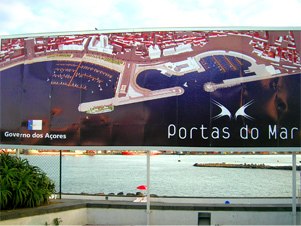 In july 2008 the new harbour construction, called "Portas do Mar" ( gates to the ocean ) has been inaugurated. The main building consists of a cruising ship terminal which divide the construction easterly into a bar and restaurant area and forms westerly a new marina with additional 440 berths. 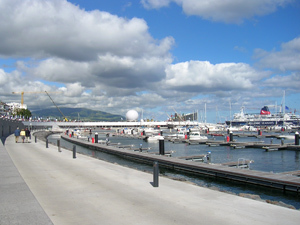 The reception pontoon for check-in is still located in the "old" marina Pero de Teive as well as the marina office, customs and immigration offices. Arriving yachts first needs to dock there to do the clearings. 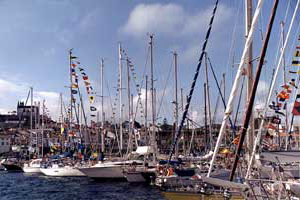 Boats which needs repairs should ask for a berth in the "old" marina Pero de Teive, because only there exists facilities for repairs.